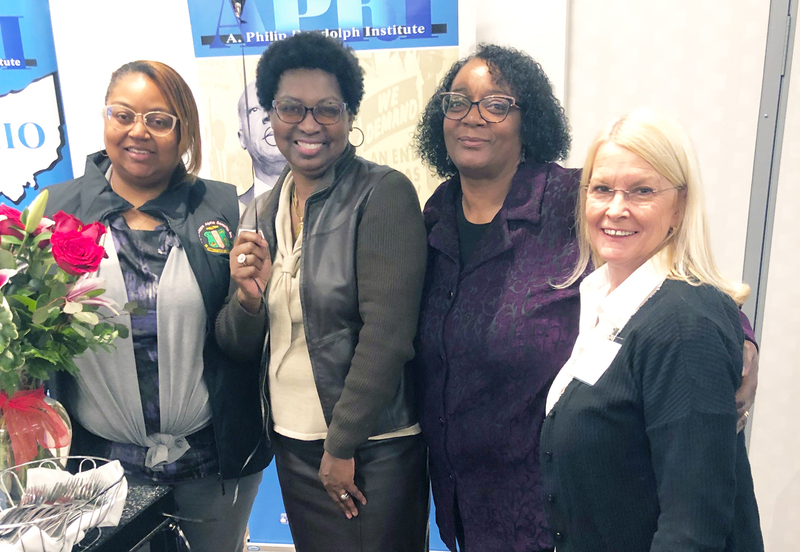 It is with great pleasure we announce that AFSCME’s own Pierrette “Petee” Talley, was honored with a Lifetime Achievement Award by the Ohio Chapter of the A. Philip Randolph Institute (APRI). “This is a well-deserved recognition of her life-long career as a union activist. Beginning as an AFSCME Ohio Council 8 staffer in 1980, she rose to one of the highest offices of Ohio’s state federation of labor,” said Ohio Council 8 Field Services Director Marcia Knox, who introduced Talley at the APRI awards ceremony held in Dayton. “Petee Talley has always been a dedicated trade unionist who has been described as “a Rosa Parks of the Ohio labor movement,” Knox said. She has held several positions with AFSCME including working as the union’s political and legislative director in Michigan from 1994 to 1999. In 1999, the national AFL-CIO appointed Petee to the position of Ohio Director of Field Mobilization. In that capacity she was responsible for directing and implementing programs that engaged union affiliates and activists around political, organizing and legislative activities and working with the state’s central labor councils. Talley was elected as Ohio AFL-CIO Secretary-Treasurer in 2002 and retired in 2019. She succeeded Donald K. Day, the first African-American and first public employee to hold the position. She is the first woman to hold that position. In January she was honored with the “World Peace Prize — Roving Ambassador for Peace” by the Capitol Hill-based Irish National Caucus. Founded in 1965, the A. Philip Randolph Institute (www.apri.org/) is an organization committed to the fight for racial equality and economic justice. Today, APRI is led by President Clayola Brown, whose vision and energy has sparked a new beginning for the organization and for the movement as a whole. Left to right, AFSCME Ohio Council 8 Dayton Regional Director Stacey Benson Taylor, Petee Talley, Ohio Council 8 Field Services Director Marcia Knox, and Dayton Miami Valley AFL-CIO Executive Director Dianne Walsh.